Banzai! The both paws raised lucky cats in our collection are perfect for those that want a double packed punch of good luck to come their way. The Japanese lucky cat has been around since the 1800's and continues to be a popular way to beckon good luck into businesses and homes. There are many versions of this Asian lucky cat, and Mrs. Lin's Kitchen is proud to offer a wide ranging assortment for spreading good luck. Typically, it is believed that the raised left paw of the cat brings in business. The raised right paw is for beckoning good luck and wealth. So, the raised left paw version is usually displayed at the business and the other version is displayed in the home. However, with this double raised paw version of the Japanese lucky cat; you can cover all bases! As we have searched far and wide to find these extra special lucky cats; you can choose from our pocket-sized little cats or from our delight maneki neko banks that do double duty. 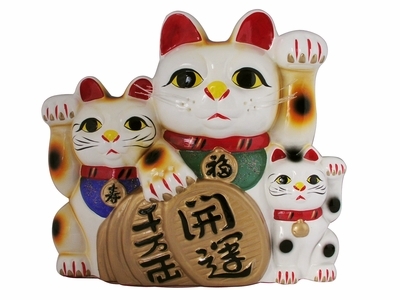 As a boost of luck to yourself or presented as a gift for special occasions, we can all use the double powered good luck of these lucky cats.